MANILA, 7 September, 2018 – Consumer protection training tools are being developed by ASEAN in six key areas, namely; healthcare services, consumer credit and banking, environment, phones, internet and e-commerce, product safety and labelling, and professional services. 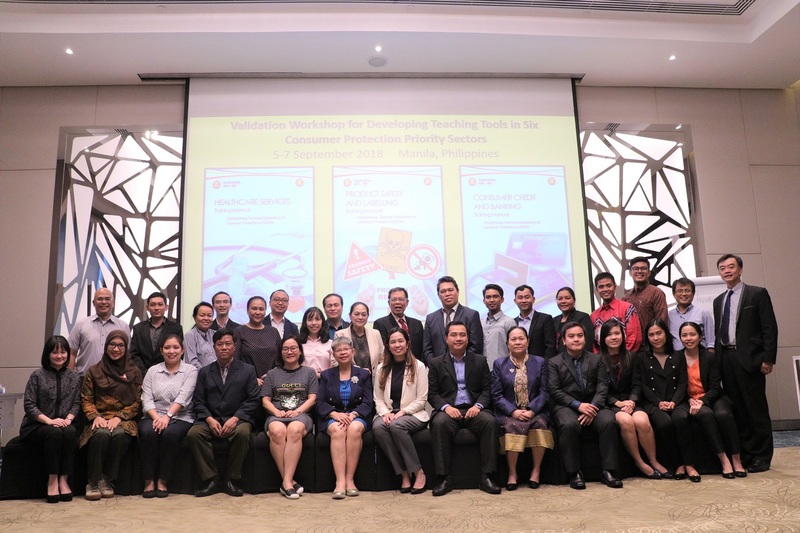 A workshop was held to validate the training tools with the participation of experts from consumer protection agencies and relevant government bodies from 3-8 September in Manila, Philippines. The workshop aimed at ensuring that the materials are easy to comprehend, useful to train relevant officials on consumer protection issues and redress mechanisms, and can easily be replicated or translated by ASEAN Member States’ consumer protection bodies. In her remarks, Dr. Divina M Edralin, Director of Research and Development Center of San Beda University, stated that the workshop is aimed at ‘assessing and evaluating whether the training materials will be helpful in developing the capacity of officials within their respective Ministries regarding consumer protection’. Each module is divided into five sessions; substantive consumer issues, pre and post government intervention schemes, redress mechanisms and communication tools, which were delivered by way of a combination of teaching techniques including video showing, lecture, case analysis, structure learning activity, role play, and open forum with inquiry-oriented discussions. The participants, also underwent a session to enhance their skills as trainers where relevant competencies required of trainers were highlighted. The Workshop was supported by the ASEAN-Australia Development Cooperation Program Phase II (AADCP II) and organised by the ASEAN Secretariat together with a team of Training Consultants from the Center of Research and Development of De La Salle University, Manila, the Philippines. The development of the training tools is part of the initiative under the Strategic ASEAN Consumer Protection Action Plan 2025 to develop tools and technical capacity to apply consumer protection legislation, and is expected to be finalised by end-2018.